On August 9th 1945, an atomic bomb was dropped on Nagasaki and over 40,000 people were instantly killed including (as far as this film story is concerned) the husband and a few siblings of a woman who is now the grandmother of four children. 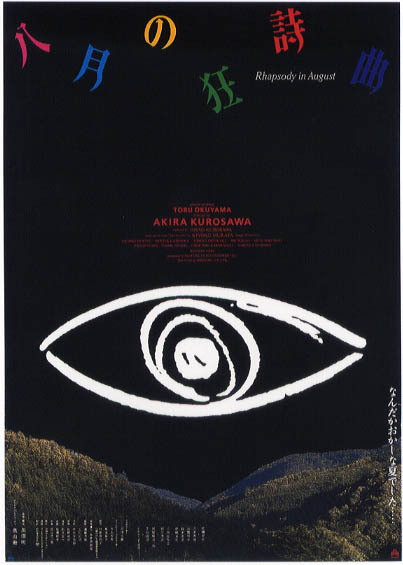 Whether or not Akira Kurosawa made this film or not, the bombings of Hiroshima and Nagasaki will never be forgotten but what is perhaps surprising in this film is that there’s no real antagonism towards the Americans and instead it’s a simple reminder to all humanity that the consequences of not respecting one another can be catastrophic. The Japanese title of this film is ‘Hachi gatsu no kyoshikyoku‘ and interestingly the Hollywood star Richard Gere would go on to star in another Japanese related film starting with the same first word by way of ‘Hachi: A Dog’s Tale‘ (2009) telling the story of the iconic dog. Of course he’s way more famous for his other film roles (‘American Gigolo‘, ‘Pretty Woman‘, ‘An Officer and A Gentleman’ etc) and he does only feature in the final third of this movie but that’s more than enough to merit its inclusion in this Tokyo Fox series! It’s not the first time a Kurosawa movie has been reviewed here though as ‘Kagemusha‘ (1980) was also included for similarly vague reasons relating to the executive producers! For once this is quite a short Kurosawa film (98 minutes) and it’s also not one about samurai warlords laden with symbolic references to Japanese society. Instead, we see his most humanistic film which is quite moving at times and is a poem against war and the scars it leaves on the minds of those who have suffered. The main person to have endured agony here is an elderly woman called Kané who is living a peaceful care free life close to nature in the Nagasaki countryside, but the memory of the disaster continues to haunt her and she is forever laden with heavy memories of the past. She is the most intriguing character and a convincing one at that. She displays a range of emotions including suffering, wisdom and forgiveness as embodied by the phrase “blame it on the war” which she continues to repeat throughout the movie. She tries to communicate this message to her four grandchildren who seem interested in their country’s sorrowful history and it is kind of through their eyes, as well as their naive words, that Kurosawa lets us in on the tragedy. As the memorial day is approaching Kané learns that her only living brother is in Hawaii (having made his fortune in pineapples) and wants to see her before he dies but she is a little reluctant to go despite the grandkids urging her to. Next, the parents return from their very own Hawaii trip and, hoping to get in on the wealth of the Hawaiian family, they try to persuade Kané to go. However, when the son of Kané’s brother (Richard Gere), suddenly arrives in Nagasaki, the parents are sure it’s because he wants to end the proposed visit because they guess he must resent the idea that his own country caused the death of Kané’s husband a.k.a. his uncle. There is a very nicely filmed scene in the latter part of the film where the four kids and their granny are sitting under a blue moonlight whilst the adults are just obsessed about the wealth of their distant relatives. ‘Rhapsody In August‘ has pretty much no soundtrack other than the natural sounds of wind, water, traffic and people as well as the old organ in the house which one of the older boys plays at opportune moments. 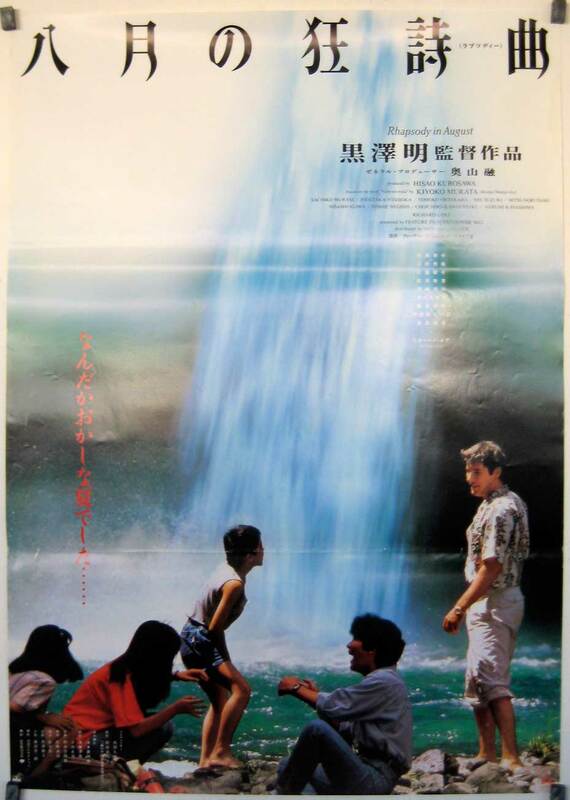 A range of themes are touched on throughout the film such as the effect of the atomic bomb on both nations, the attitudes of the three generations and the effect of American culture on the Japanese. The film moves along at a slow pace and I was a little disappointed that there was no conflict at any time. There are chances aplenty to make Clark (Gere) feel guilt for what his country did but he was let off and spared any real pain or discomfort as everyone bowed their heads, apologised and forgave one another. The ending is a all a bit weird for me as a violent thunderstorm erupts over the village which Kané believes to be a new bomb fallen on Nagasaki leading her to run desperately for cover chased (eventually) by her entire family in a scene that is a little theatrical but one that has a lasting impact with the broken umbrella coming to represent a flower of peace or something like that! This entry was posted in Review: Films Set In Japan and tagged Akira Kurosawa, can Richard Gere speak Japanese?, films set in Japan, films set in kyushu, films set in nagasaki, Hachi gatsu no kyoshikyoku review, rhapsody in August review, tokyo fox, watch rhapsody in august online free. Bookmark the permalink.